For anyone who lives in an area where even moderate snowfall is expected in season, those cold winter mornings clearing the snow from drives, paths and patios are the ultimate chores. Yet, if you need to get the car out to go to work, or to take the kids to school, it has to be done, so you need to be prepared! 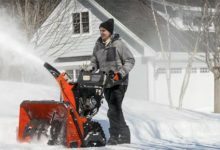 The old shovel technique is probably the one you go for, and you’re not alone, but what is it that your neighbor is using to clear the snow from their drive? It’s probably an electric snow shovel, and they are becoming much more popular thanks to being available now for domestic use. You may well have seen larger versions used by your local borough, to clear snow from city streets early in the morning. 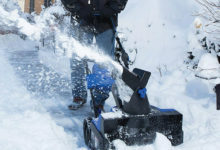 Those are larger, commercial and some of the best snow blowers on the market, but you can also have one, a domestic show shovel that will make your life a lot easier, and that will also cost you very little. What are they all about, and why do you need one? We took a look at a very popular and affordable domestic snow shovel – the Earthwise SN70016 Corded Snow Shovel – so that you can see just how much help one of these could be to you. 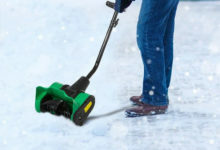 We recently featured the Earthwise in our top 10 best electric snow shovel reviews for good reason. 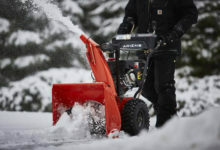 It’s a machine designed to do the job of a manual shovel by way of powered blades – or augers – which shift a great deal of snow in a short time. 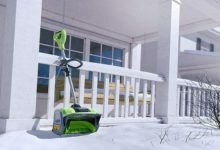 There are several types: you can get petrol-powered snow shovels as well as electric ones, and among the latter, there are those that come with a mains power cord, and those that are powered by rechargeable batteries, and are therefore cordless. The model we are looking at today – the Earthwise SN70016 Corded Snow Shovel – is one of the corded models. This means you will need a nearby mains point to plug it into. You probably have one in your garage, so that should be no problem. The beauty of a powered show shovel is that it means you will spend far less time outside on cold, wet, winter mornings, and it will also give you a much better clearance. They tend to be adjustable, so any of the family can use them and are perfectly safe with in-built cut-off and other safety features. This model is designed specifically for domestic use, so is not as large or powerful as some, but for areas where moderate to heavy snowfall is expected, this could be a tool that you find invaluable. Let’s have a closer look at the Earthwise SN70016 Corded Snow Shovel in more detail, so you can see just how you can benefit from this impressive machine. First, it’s important to stress that the Earthwise SN70016 Corded Snow Shovel is one that is powered by a fixed electric point. This is not a rechargeable model. That has its advantages and disadvantaged: the plus is that you do not have a limited running time as determined by the battery capacity; the downside is that you do have limited range of use, so will need an extension cord if you need to go further. Another advantage of corded models is that they can be more powerful than the cordless variety (note there is a cordless version of this very model, which you might want to check out) and this one comes with a 12Amp motor that can provide 4500rpm. That is good enough to shift a massive 430lbs of snow every minute – you will have your drive, paths and garden cleared in no time at that rate! 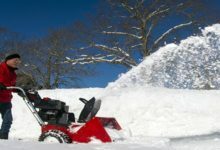 Another feature to look for when choosing a snow thrower is the clearance width and depth. 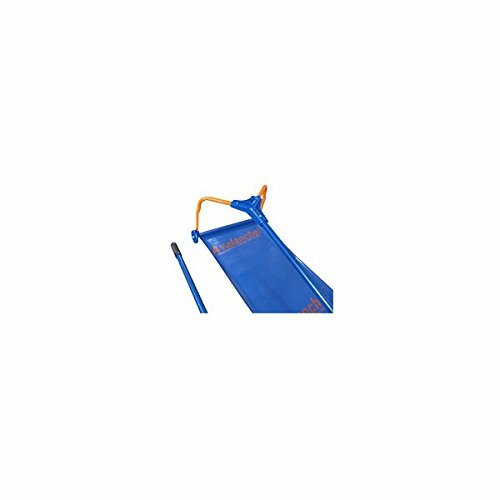 The Earthwise SN70016 Corded Snow Shovel has a clearance width of 16-inches. For a compact model such as this is, that is a very impressive capacity that we cannot fault. Also, a depth of 8-inches is more than most in its class, so it will happily handle heavy overnight snowfalls. This model can throw the snow 30-feet; that’s about the norm for a domestic snow thrower. 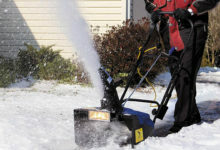 It does have an adjustable chute – with the turn of one knob you can choose to throw snow forwards, left or right – but users have reported it is most efficient in the forward operation. It’s easy to use as it weighs only 16lbs, and customer reviews are very favorable in this area. It also comes with an adjustable handle so anyone can use it, and is fitted with all the usual safety features. 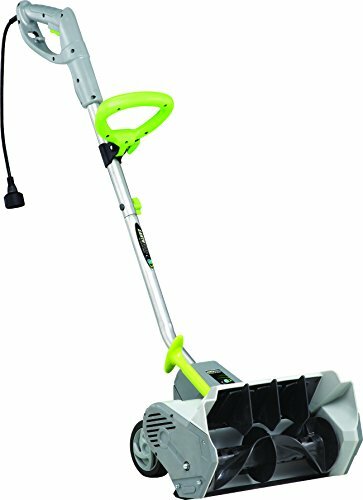 For a domestic-use snow thrower, the Earthwise SN70016 Corded Snow Shovel is a good choice, the only factor to consider is perhaps the fact it is corded, which restricts you on the distance from the outlet you’ll be able to use it. 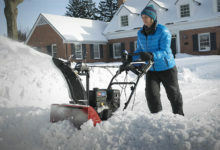 As you can see, the only downside we can see is that the Earthwise SN70016 Corded Snow Shovel is not a cordless rechargeable model, but that may not be a problem for many users. So, is this the one for you? Is The Earthwise Snow Shovel for You? The specifications of the Earthwise SN70016 Corded Snow Shovel, especially its clearance rate, width and depth capacities, are very impressive and mark this out as one for the shortlist. The major potential drawback is that it is not cordless. If that is not a problem for you, and you can reach the areas that need clearing with a corded model, then this could indeed be an excellent choice at what is a very sensible price. If you want to check it out there is an identical cordless model in the Earthwise range that may also appeal. We recommend this very neat and affordable, not to mention capable, snow shovel for anyone who needs to clear snow regularly, and wants an easier life!